WASHINGTON (AP) — Jeffrey Lacker, president of the Federal Reserve Bank of Richmond, resigned Tuesday effective immediately after acknowledging improper discussions with a financial analyst that became the subject of a lengthy investigation into leaks at the Fed. In a statement, Lacker said that in October 2012 he spoke to an analyst at Medley Global Advisors who possessed “highly confidential” information about interest-rate decisions the Fed had considered at its September meeting. He said that after the analyst had introduced the information, he should have declined to comment, ended the call and reported to Fed officials that the analyst was in possession of confidential information. 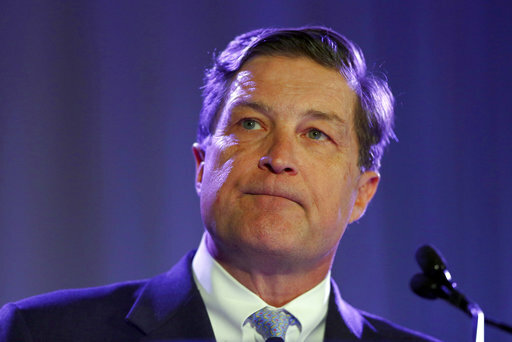 Lacker called his conduct “inconsistent” with the Fed’s confidentiality policies. “I deeply regret the role that I may have played in confirming this confidential information and in its dissemination to Medley’s subscribers,” Lacker said. Richard Cullen, Lacker’s attorney, said that Lacker had been informed that the investigation into his role in the Fed leak had been completed and no charges would be brought against him. Lacker, who had already announced in January that he was planning to step down in October, said that he failed to disclose in a subsequent investigation in 2012 the full details of his conversation, specifically the fact that the analyst was in possession of confidential Fed information. He said when he was interviewed again in 2015 as part of investigations being conducted by the FBI, the Fed’s inspector general and the U.S. Attorney’s Office for the Southern District of New York, he did disclose that the analyst was in possession of confidential information. “I have always strived to maintain the appropriate balance between transparency and confidentiality, but I regret that in this instance, I crossed the line to confirming information that should have remained confidential,” Lacker said in his statement. Members of Congress including House Financial Services Committee Chairman Jeb Hensarling, R-Texas, have been sharply critical of the Fed’s handling of the 2012 leak. Hensarling specifically complained about the Fed’s refusal to provide information about the investigation to his committee. Fed Chair Janet Yellen in 2015 had told the committee that she was unable to provide some documents sought under a committee subpoena because doing so could jeopardize a criminal investigation by the Justice Department and an on-going investigation by the Fed’s inspector general. In a statement, the Richmond Fed said that it placed a “high priority on safeguarding information.” It said that once the bank’s board of directors learned of the outcome of the government investigations, it had taken appropriate actions. The statement said the bank’s search process for Lacker’s successor would continue. In the interim, Mark Mullinix, the bank’s first vice president, will serve as acting bank president.